Capable of quickly transporting units that would otherwise travel by foot. Wagons are transport units which can load other ground units into them and transport them over long distances. They're available to recruit from a Barracks for 300 gold. Wagon Cherrystone Kingdom Cherrystone Wagons were originally built to transport goods to market. Though long since reassigned, it's not uncommon for a band of soldiers to emerge from one with the faint smell of cinnamon buns clinging to their clothing. Wagon Felheim Legion Though small, Felheim's Wagons are capable of transporting a surprising number of footsoldiers by means of an ingenious method that involves disassembling them and laying their bones in neat rows. In an effort to avoid bone-ownership disputes, most have taken to engraving small emblems into their skeletons that serve as name tags, and some even add reassembly instructions. Wagon Heavensong Empire Driven by monkey-masked footsoldiers, Heavensong's Wagons are masterfully constructed, and require very little horsepower despite their large frames. 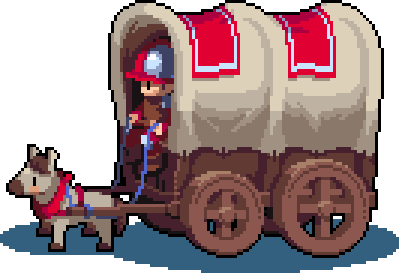 Heavensong's Prince Koji speaks often of a future with horseless Wagons capable of travelling vast distances, though his advisors consider this little more than a childish dream. Wagon Floran Tribes The bed of a Floran Wagon is covered in soil that houses the roots of the gigantic plants that form the Wagon's canopy. As with much of the life used in Floran construction and armour, the leaves are remarkably strong, and regenerate at an astonishing speed. The Wagon is pulled along by a friendly fluffalo, commonly found in the Easterly Glades. Transport units cannot attack other units. When ground units move beside them they'll have the menu option 'Load' to enter the transport. After moving, the transport has the option to unload the unit inside, or to wait. All units with the Walking or Amphibious movement types can be loaded into a Wagon, except for Giants. If transport units are killed the unit inside is destroyed as well. It is usually better to load a unit into a colorful wagon (which can still move this turn) than to load a unit into a grayed-out wagon (which cannot still move this turn). This is because, by loading into a grayed-out wagon, you miss the chance to combine the movement ranges of the two units (the wagon and the transported unit), as is described in more detail below. Because units are loaded/unloaded from adjacent tiles, effectively transporting them one additional tile while loading/unloading, the combined movement range of a transported unit which uses a Wagon for one turn is (walking movement range of transported unit)+1+12+1 = 14 + (walking movement range of transported unit). So, for example, a Spearman can move up to 17 tiles in one turn using a wagon, though it wouldn't be able to attack the same turn. It is often a good idea to prepare a wagon so that it is ready to load a new unit as soon as that unit is able to move, i.e., the turn after it is purchased. The obvious way to do this is to leave a wagon next to the Barracks which will build the new unit, but this would not make full use of the combined movement range of the wagon and its transported unit. Because Barracks produce units 1 tile away from the barracks itself, effectively transporting the new unit one tile, it is optimal to position the wagon 1+(walking movement range of new unit)+1 = 2 + (walking movement range of new unit) spaces away from the barracks. So, for example, a wagon should wait 5 tiles away from a barracks if it is about to produce a Spearman (assuming no forests or mountains obstruct the path between the spearman and the wagon). This page was last modified on 5 March 2019, at 13:49.